An essential companion piece to Stefan Zweig's classic The World of Yesterday, this memoir addresses many of the questions that this internationally celebrated author raised but did not answer. A professional journalist and researcher in her own right who first encountered Zweig in 1908, Friderike threads her story between what Zweig called the Scylla of "exaggerated candor" and the Charybdis of self-love. She paints a detailed portrait of her famous husband from his birth into a wealthy Jewish family in late 19th century Vienna to his suicide (with his second wife) in Brazil in 1942. Married to Stefan Zweig, first published in 1946 under the title Stefan Zweig, provides a thorough overview of the writer's poems, plays, stories, biographies, essays and articles, his work habits, and his relations with editors, publishers, friends, mentors and protégés. Friderike also illuminates facets of the tumultuous context of political and social upheaval in which Zweig worked during his years in Salzburg and London. 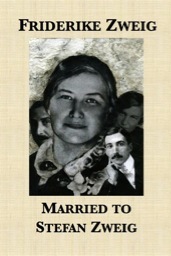 Married to Stefan Zweig is among the very small number of women’s memoirs from 20th century Central Europe and an unusual portrait of a marriage anywhere, anytime.